Although the book was officially out two weeks ago, it’s now out-out. Most stores have now received their stock and put it out on the shelves. I’ve included some retailer links HERE. It’s available in SA from most book retailers as wells from various on-line retailers. Kindle and eBook versions are available from Amazon and others for worldwide consumption. Amazon will receive physical copies of the book in a few weeks for international delivery. Thanks again to Penguin Random House and their amazing team for all their work on this book, Yeshiel Panchia for the super ‘now’ photos and the various archives for the ‘then’ photos. 26 Oct	This entry was published on October 26, 2018 at 8:41 am. 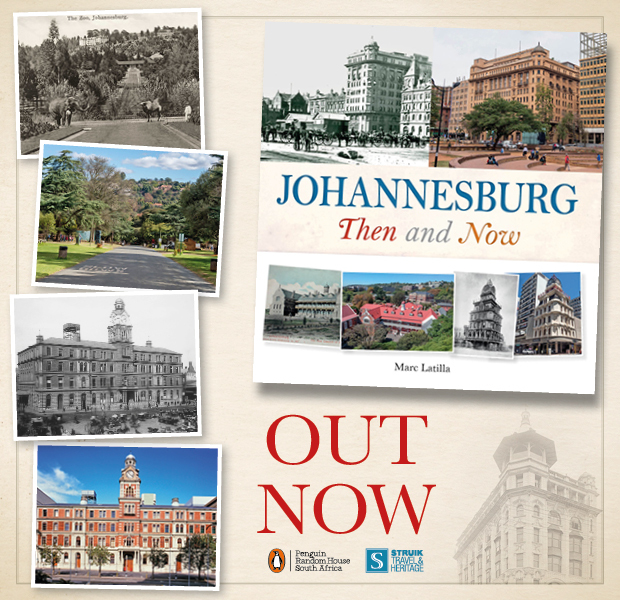 It’s filed under Johannesburg and tagged Johannesburg Then and Now. Bookmark the permalink. Follow any comments here with the RSS feed for this post. On my way to Ike’s right now. Hope they have one. Otherwise will certainly find two. Have to give one to a friend before she sees it. BTW, Marc. is the quote on ‘what is fashionable now’ yours? I’d love to use it and would like to attribute it. Hi, It’s not mine but I don’t remember where I got it from. Will let you know when I come across the info.